Posted on Sun, Mar 18, 2012 : 5:59 a.m.
Ann Arbor does it up different. That's the message that will echo throughout the U.S. when a new Pure Michigan national cable TV advertising campaign hits airwaves across the country soon. The new Pure Michigan ads will run through June, and four partners — Ann Arbor, Mackinac Island, The Henry Ford and Traverse City — are contributing a combined $2 million toward this year's national campaign, according to the Michigan Economic Development Corp. According to a new Pure Michigan ad campaign, Ann Arbor does it up different. The total budget for the 2012 campaign is $12 million — the largest budget ever dedicated to promoting Michigan as a tourism destination nationally, MEDC officials said. While some Pure Michigan ads begin airing Monday, national partner ads like the one promoting Ann Arbor won't be added to the rotation until mid-April, MEDC officials said. A 30-second TV spot featuring Ann Arbor was posted to the Pure Michigan YouTube channel last week. It showcases everyday life in Ann Arbor, including a resident carrying a bicycle down his front porch steps, people walking through an arched entrance to the grassy courtyard of the University of Michigan Law Quad, a street musician playing in front of the mural of famous writers along East Liberty Street, the fountain under the Burton Memorial Tower, the gates to the Big House, Nickels Arcade, street-side diners outside Gratzi on Main Street, a scene from the Farmer's Market, a Zingerman's employee grabbing a loaf of fresh-baked bread from a shelf, and kids playing by the spinning cube on U-M's Central Campus. "City by city, town after town, one sidewalk blends into another," the voiceover states in the video. "But there is a place where every street is different, every corner plays a new song, every day is a festival, where storefronts, cafes and artists all say, 'Mix it up, take another taste, linger a little longer.' Ann Arbor does it up different. Ann Arbor does it Pure Michigan." MEDC spokeswoman Michelle Begnoche said that's the only Ann Arbor TV spot that will run on the national cable stations, but there are more elements that are part of the Ann Arbor promotional campaign, including promotion of Ann Arbor SPARK objectives in the region. She said the campaign will include a two-minute promotional video highlighting the area's thriving business climate and arts and cultural offerings, as well as one or more press trips to invite journalists to experience Ann Arbor and the surrounding areas. The plan also includes pitching national and regional publications on all that Ann Arbor and the surrounding areas have to offer businesses, residents and visitors alike. Other highlights of Ann Arbor's national partnership with the Pure Michigan brand can be found on the Ann Arbor partner page. The Pure Michigan website also carries this message: "Plan a trip to Michigan's Ann Arbor, where the pulse of a big city comes with the handshake of a small town. Experience the flavors of festivals, art, music and history. Spend a little time in Ann Arbor." It also describes Ann Arbor this way: "A place that embraces the unique and unusual. Where the art challenges the mind as much as it engages the eyes. And where trying a new taste is always on the menu. The storefronts, cafes and artists of Ann Arbor do it up a little different. So break away from the ordinary and come to Ann Arbor." MEDC officials said this will be the second year for the Mackinac Island, Henry Ford and Traverse City partnerships, but the first year for Ann Arbor. Each of the four national sponsors contributed $500,000 as part of the Travel Michigan Partnership Advertising Program. The Ann Arbor Area Convention and Visitors Bureau, the Ypsilanti Area Convention and Visitors Bureau and SPARK are the partners putting up the local funding for the initiative. The MEDC plans to allocate $500,000 from its Pure Michigan funds, with a matching amount from SPARK and the local CVBs. The Ann Arbor and Ypsilanti CVBs each plan to allocate $230,000 and SPARK plans to allocate $70,000. The Pure Michigan television commercials are expected to air nationally more than 5,000 times combined on these cable networks: A&E, ABC Family, Animal Planet, Bravo, CMT, CNN, the Cooking Channel, E!, Food Network, Fox News, the Golf Channel, HGTV, Lifetime, Lifetime Movie Network, MSNBC, Nick at Nite, OWN, the Outdoor Channel, Oxygen, Style, The Learning Channel, the Travel Channel, USA, WE and the Weather Channel. Other featured ads in the rotation can be viewed at michigan.org. Travel Michigan, part of the MEDC, is the state's official agency for promoting tourism. George Zimmermann, vice president for Travel Michigan, said there have been dramatic increases in the number of out-of-state visitors coming to Michigan on vacation in recent years. "We anticipate 2012 will be another big year for tourism in Michigan, and this national campaign is major factor in driving that momentum," Zimmermann said. The Birmingham office of McCann Erickson developed the Pure Michigan campaign in 2006. It expanded from a regional campaign in 2006-2008 to a national campaign in 2009. Tue, Mar 20, 2012 : 3:09 a.m.
Mon, Mar 19, 2012 : 12:12 p.m. While our favorite things about Ann Arbor may be missing from the commercial, it isn't actually aimed at those of us who live here. It's aimed at tourists. There's a tremendous amount of research about how tourists make decisions on where they visit, how much they spend, what they want to see, and what they want to eat. Too, with the number of conferences here, this may be aimed at encouraging participants to bring their spouses with them when they attend a professional meeting. I'm not privy to that research, but my guess is that the imagery in the commercial addresses motivators to visit. Mon, Mar 19, 2012 : 9 p.m. This is one tiny segment of a year-long, national and international promotion of the State of Michigan. The world does not center or revolve around Ann Arbor. The rest of Michigan is included in the rest of the promotion. The STATE OF MICHIGAN guys, NOT ANN ARBOR. Mon, Mar 19, 2012 : 12:13 a.m.
Mon, Mar 19, 2012 : 2:42 p.m.
Mon, Mar 19, 2012 : 1:39 a.m.
Keep watching TV and magazines for the rest of the Pure Michigan series. Why would aa.com feature the rest for an AA publication? Sun, Mar 18, 2012 : 11:41 p.m.
Sun, Mar 18, 2012 : 11:17 p.m.
Sun, Mar 18, 2012 : 9:49 p.m. The ad does not highlight Dreiseitl's $770,000 rusty beam exhibit in front of the municipal building. I wonder why? Sun, Mar 18, 2012 : 11:21 p.m.
That's because it was declared a phallic symbol last week by a group of Lorena Bobbit supporters. Sun, Mar 18, 2012 : 9:28 p.m. Thanks to SPARK for 'their' generous donation to this project. Have their opened up their books to Ann Arbor taxpayers yet? Still waiting for the investigative reporting. Lol. Sun, Mar 18, 2012 : 8:30 p.m.
You folks complaining about the slogan in terms of the use of adverbs don't fully understand adverbs, and just don't get the slogan itself. You have to look at how the modifying work relates to other parts of the phrase, or to the phrase itself. The 'different' is the entitative outcome of &quot; Ann Arbor does it up&quot;. It is not an adverb modifying a verb. It is essentially a adjective modifying the outcome of 'doing it up'. The slogan is meant to describe an entitative outcome, not a process or an action. The 'it' that Ann Arbor 'does up' is 'different' from the 'it' that other towns in other states 'do up.' The &quot;it&quot; is the experience of being in Ann Arbor. Thus, you cannot say &quot;The experience of being in Ann Arbor is differently from the experience you get in other cities in other states.&quot; You would say, &quot;The experience of being in Ann Arbor is different from the experience you get in other cities in other states.&quot; Yes, it's awkward, but it's not grammatically incorrect. @Jay, when I read things like &quot;The 'different' is the entitative outcome...&quot; I thought to myself, &quot;Well, this is hardly clarifying anything.&quot; Thus, my tongue-in-cheek biblical quote. But, if you could be more specific as to what about @edjasbord's comment is fundamentally wrong, I would appreciate it. Frankly, I can't understand it well enough to assess its accuracy. Tue, Mar 20, 2012 : 12:52 a.m. Typical Ann Arborite response. Sounds complicated and smart, but is really fundamentally wrong. Sun, Mar 18, 2012 : 9:52 p.m.
Sun, Mar 18, 2012 : 7:10 p.m.
Great ad! THAT is how I see Ann Arbor! Sun, Mar 18, 2012 : 6:42 p.m.
Good Grief!! What a bunch of whiners. I Loved Ann Arbor and lived there for longer than 40 years not including College. I made a choice to move ffor health reasons but would come back in a minute if that was not a problem. Sun, Mar 18, 2012 : 11:19 p.m.
Sun, Mar 18, 2012 : 8:48 p.m.
You are so right! Whine, whine, whine. And when they aren't whining, they are seeing nefarious plots in anything and everything that goes on. I'm surprised anyone comes to Ann Arbor, or stays after they get there. Ooooooo! that's going to get the whiner/suspicious going. Sun, Mar 18, 2012 : 6:36 p.m. Here's hoping http://www.notsopuremichigan.com/ does one on Ann Arbor. There's on on UM Football, but not A2. Sun, Mar 18, 2012 : 5:37 p.m. Follow the money. After all is said and done, how much is the Michigan taxpayer (you know middle-class workers, seniors and the poor) paying to promote those businesses chosen to be featured in these ads? 1. Why Ann Arbor? What connection might it have to those making decisions to fork out this free advertising? 2. Where do these &quot;Partners&quot; get their money from? Does any of it come from grants or cheap loans from the state? 3. What businesses benefit and why these businesses? What is the &quot;magic&quot; criteria for being featured? 4. WHAT DOES ANY OF THIS HAVE TO DO WITH PUTTING PEOPLE ALL OVER THE STATE BACK TO WORK AT DECENT PAYING JOBS? I am not talking about wages that can't support a family. I am not talking about reducing the risk on ventures for start-ups that simply prove out a new technology that is sold to the highest bidder often out-of-state or out-of-country so that the already hefty returns (20% to 40%) to the venture capitalists and angels involved with this kind of start-up is even more attractive. Follow the money. It seems to flow out of middle-class taxpayer pockets into the hands of a few. If the businesses featured in this video need free advertising from my hard earned tax dollars to make it, maybe they shouldn't be in business. It seem our governor and his friends went to a school that taught a &quot;different&quot; meaning of the word &quot;profit&quot;. Sun, Mar 18, 2012 : 9:36 p.m.
@Julieswhimsies, face it, no one wants to come to Michigan, and no one has any reason to do so!!! Sun, Mar 18, 2012 : 7:13 p.m. It's about tourism. Michigan needs more of it. More tourists. More jobs. As one watches the video, the scenes at the individual businesses were so fleeting that I would not have been able to recognize which businesses were portrayed without having known ahead of time (based on the content of this article) which businesses were included. So, if any particular business in this video paid money to be featured, I hope for their sake it wasn't very much since the return on the dollar would have been minimal. By portraying Michigan (as exemplified by Ann Arbor in this particular video) as an attractive place to visit, recreate or work, that increases the likelihood that people will want to come to Michigan to visit, recreate or work. That, in turn, increases economic activity which should benefit all. It's part of a long-term investment in the state. Sun, Mar 18, 2012 : 6:02 p.m.
Sun, Mar 18, 2012 : 5:17 p.m.
Ann Arbor is a terrible place to live in. As a student here for 4 years, I thought the locals were seriously stuck up. I used to wear American flag T-shirts, because I got them for free. Turns out, the locals don't like that too much. I thought I was living in America, not Afghanistan? Some guy that wrote for the Michigan Daily actually called me out on it one time! He had a class with me the semester that he wrote it, that's how I know he was referring to me! If you're a friendly person who is humble, proud of your country and don't have a large trust fund, don't come to Ann Arbor. It's not for you! I'm glad I got out. I had friends when I left, but I pretty much cut all ties with them a few years ago. Every time I used to see them in Ann Arbor, they would always have something obnoxious or arrogant to say about where I lived or worked at. I got tired of the childish obsession locals have with proving they are smarter or superior to you and other people. Ann Arbor is beautiful, but it's a sad city full of unhappy rich liberals. There are honestly much better places to go. I wish I went to MSU instead, East Lansing is a lot more fun. Mon, Mar 19, 2012 : 7:05 a.m.
You make a lot of generalizations Jay. I'm sorry that you had a bad experience but you should realize that there is no such thing as one place being better than another, it may just suit you. Personally, I've found Ann Arbor to be very friendly. I also find that I can always find something interesting to do and i can always find an intelligent conversation on just about any topic that I can think of. But what I find interesting might just bore you to tears. I lived in E. Lansing for a decade and found it to be awful for me. No culture and few people that shared my interests. Most of the faculty at MSU are frustrated and angry that they couldn't get a more prestigious job after working so hard for their education. I tried living in the country for a while but found it desolate. Some call it tranquil. But I don't insult all of the people who lived there. They like it and if you dropped them in the middle of the city they would probably go nuts. Don't make generalizations. There is a place for everyone and everyone is different. Hopefully you will find your place. Mon, Mar 19, 2012 : 2:02 a.m.
@MjC, that is so bogus. In 4 years of living in Ann Arbor and trudging all over town, everyday, I saw the same miserable, unfriendly, arrogant people. Very few people had any manners. People that were acquaintances from anywhere either were too snotty or lacked the social skills to say hello. They would always look away to avoid saying anything. I had a southern friend who hated it to. We went to lunch one time and he held a door open for a random lady. He got quite a nasty look from her in return for doing so. When I visited New York City, I found that it was friendlier than Ann Arbor! I always noticed that as soon as I got to Ypsilanti, civilization began again. I started seeing more kids and the mood improved. People were friendlier. Get back to Ann Arbor, and it's totally frosty. There's nothing even that great about that town. The food is overrated, uncreative and expensive and the shopping is worthless. Ann Arbor is in love with itself without a good reason to do so. East Lansing is far superior in every way. Sun, Mar 18, 2012 : 11:57 p.m.
Wow, Jay. I feel sad that you've had such a terrible time here. I've always found that majority of people in A2 to be very kind, friendly, funny, and compassionate (and, yes, a bit quirky). Of course I've run across some of the personalities you've described, but those folks are few and far between. I hope someday you'll surround yourself with the people who do care (in Ann Arbor you'll find many of us at the humane society, farmer's market, UM, Zingerman's, the Ark, pubic schools, hospitals, Ann Arbor Art Fairs, Ozone House, Thrift Shop, churches, Food Gatherers, local restaurants... Seriously, I wish you all the best wherever you are and wherever you go. Sun, Mar 18, 2012 : 4:47 p.m.
Sun, Mar 18, 2012 : 3:40 p.m. This town is so very full of itself. Look, I like Ann Arbor, I moved BACK here long ago because I was enchanted, but home ownership and actually paying attention to where money goes can really jade you. There are LOTS of downtowns in this country that are the same or better, and for some reason Ann Arbor has the impression that it's New York City. I have yet to see an item in a Main Street store that can't be purchased at any decently sized airport. Real Estate/Developer companies push out small businesses because of RIDICULOUS rents, and then sit on vacant properties because they're convinced some sucker (big chains as well) will eventually pay the insane rents. And it works for them. Shame though. Sun, Mar 18, 2012 : 8:33 p.m.
Sun, Mar 18, 2012 : 7:37 p.m.
You probably like Boulder, right? Sun, Mar 18, 2012 : 5:18 p.m.
That's the tip of the iceberg, but you're spot on. Sun, Mar 18, 2012 : 3:34 p.m.
Clownfish, this particular whiner stays here because we're so underwater on our mortgage, partly because of the bad economy, and can't pay it off more quickly partly because of the exorbitant property taxes. You know, the taxes that we're putting towards buying &quot;development rights&quot; of land to keep people from building on it, and new train stations and bus stations and massive parking structures and new city halls and fountains that cost about 4 times here what they would anywhere else. If I could get out from under the mortgage, we'd have been gone years ago, comfortably reading stories about more wasted tax money in our old town of Ann Arbor without being so depressed and enraged because it's no longer our money being wasted. Mon, Mar 19, 2012 : 12:55 a.m. Thank you aa.com for finally including a vote down button. Now if I could only find a way to vote this comment down twice, as it more accurately reflects my distaste for it. You shouldnt have moved here to begin with, its always been this way. If you don't think so, I can force you to agree, but I believe you are deluding yourself. Good luck leaving, we will all be happier for it. Sun, Mar 18, 2012 : 6:31 p.m. Yes, Clownfish, my wife and I are two of the millions and millions that should have done a better job researching the value of our home, who are now underwater. If only all those people underwater had done a better job, there would have been no housing crash or recession, right? Just like people should have done a better job researching Obama and/or Bush and/or Snyder/Granholm, etc. Things can get worse in places and they can get better. Or people can get sick of how it doesn't get better and go somewhere else, like we wish we could. It's not realistic to say that if someone is unhappy with the way things are going then they should have done a better job getting where they are. We who are unhappy are trying to get things to change to be better. If the roads around here were in better shape and the mayor/council stopped wasting money and actually acted in the best interest of the citizens of Ann Arbor, I wouldn't want to move. Oh, and interestingly, home prices are stable/rising after a 20-60 percent crashing drop from a few years ago. The fact that they're stable/rising NOW doesn't mean that very recently there was a huge plummeting crash and burn. Jeez. Sun, Mar 18, 2012 : 4:24 p.m.
Then you should have done a better job researching the price you paid for your home. Interestingly, home prices in the A2 area are stable or rising. Sun, Mar 18, 2012 : 2:41 p.m. I posted this link under MSC's comment, but I think it needs to be seen, so I am posting it again here. The poor grammar is embarrassing to Ann Arbor and I think the slogan's author needs to see this video: http://www.youtube.com/watch?v=dDwXHTcodNg ...get your adverbs here! Sun, Mar 18, 2012 : 2:15 p.m.
Sun, Mar 18, 2012 : 1:56 p.m. Yes, it sounds like the St. Paddy's drinking tourists showed up in numbers on S. University last night. Ann Arbor is a great city, but the Pure Michigan / MEDC stuff is (I thought), supposed to be state-wide? That is, what do other cities in Michigan feel about the concentration on Ann Arbor? What about Isle Royale and Pictured Rocks National Lakeshore? Tue, Mar 20, 2012 : 3:15 a.m.
Mon, Mar 19, 2012 : 3:05 p.m.
On You Tube Kid Rock did a great Michigan video on the UP. It is his latest single. Gotta see it. Makes me want to live up there during the summer only. Sun, Mar 18, 2012 : 10:37 p.m.
Sun, Mar 18, 2012 : 10:36 p.m. It's an example, but it's a favored example. Think about it -- the city has strong connections to MEDC/Spark/Snyder/Pure Michigan. They're all inter-connected, and Ann Arbor got more money for this than the other cities. Now, if you were a different city in the great state of Michigan, what would you think about that? It's a great video and it's great that they are promoting Ann Arbor. I'm all for the promotion, but if they don't put the same amount of effort and money into promoting our great National Parks, then it's a matter of local friends helping local friends and less of the state as a whole. The UP had a hard winter, and it would be great if they could promote that, but a video like this and the political connections that create it... can deliver a good right hand Big Mac finger to the rest of Michigan that wants to be promoted as well. Sun, Mar 18, 2012 : 8:41 p.m. This isn't all there is to the campaign. It's only the part about Ann Arbor. Check out the other cities in their promotion. It's an example, Kai, an example. Sun, Mar 18, 2012 : 1:33 p.m. 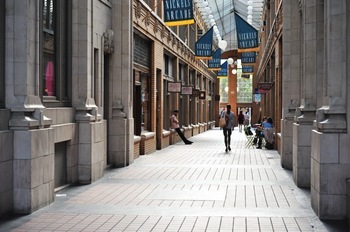 I wish Nickels Arcade actually had that atmosphere, I would start going back down there to shop. Sun, Mar 18, 2012 : 5:19 p.m.
Spot on ViSHa!!! Power of advertising! Sun, Mar 18, 2012 : 4:54 p.m.
Sun, Mar 18, 2012 : 1:19 p.m. Which would mark a person in Ann Arbor as a tourist or outsider more clearly: waiting to cross at a crosswalk, or using the expression &quot;does it up different&quot;? Tim Allen makes A2 sound as homogenous and unthreatening as Campbell's soup. Mon, Mar 19, 2012 : 3:04 p.m. They need to do an addendum to the fact that if there are any students left after April, you will know it by them not adhering to crosswalk etiquette. Sun, Mar 18, 2012 : 2:27 p.m.
You left out the outsider's car would be idling. Sun, Mar 18, 2012 : 1:08 p.m. Does it up different like the rioting in South U last night? Where's that story? Sun, Mar 18, 2012 : 1:50 p.m.
That story does not comport with our desired projecting of coolness. Sun, Mar 18, 2012 : 1:38 p.m.
A riot on South U? How pure Michigan is that? Not. I guess Ypsilanti needs to get into this as well. Unless Ann Arbor needs to pay for that new art by city hall. Nice ad. But we still hit Lake Michigan every year. Sun, Mar 18, 2012 : 1:01 p.m.
Yep, A2 is a terrible place to come to, or to live. This can be seen in low property values, lack of crowds at events and restaurants, and dirth of international headliners at concerts etc. Why do you Whiners stay here? This is a good idea, tourism drives economic growth. Why anybody would want to 'dis that is beyond me. Some personal failing that has to be broadcast in public to make people feel superior? Sun, Mar 18, 2012 : 7:11 p.m.
Amen to what you wrote, Clownfish. That a simple tourism ad could draw so many complaints says nothing about the ad but everything about some of the regulars on this site. Sun, Mar 18, 2012 : 1:21 p.m. It is the &quot;townsfolk&quot; that put on events that attract those pesky tourists who then spend money at local businesses, owned often by townsfolk. There are multiple exits from Ann Arbor if you find it such a horrible place to live. Sun, Mar 18, 2012 : 1:18 p.m. This town is full of fakery and &quot;big city&quot; wannabe. It's the fakery that needs to go, not the townsfolk that have to live through these waves of nonsense. How bout a &quot;Get Real Ann Arbor&quot; campaign? Sun, Mar 18, 2012 : 12:48 p.m. When did Gratzi start blocking the whole sidewalk with decked out tables? It's sad that no honest video of any real AA environment could be captured, and that every shot is so obviously blocked off and staged with imported actors. I like the Pure Michigan spoof videos better. Sun, Mar 18, 2012 : 12:22 p.m.
Yep, different - Hundreds of thousands for a phallic symbol, but nothing for cops - Millions to buy land we will never see, but nothing for firemen - Millions for land we need to get on a bus tour to see, but we want to sell of park land we drive by every day. - Local traffic laws with the wrong signs that (shockingly) cause accidents and confusion. Yep - we are certainly the smartest city in the country. Gotta love that book learnen. Mon, Mar 19, 2012 : 3:46 p.m. Interesting perspective given your username. Then move and be happy. Sun, Mar 18, 2012 : 2:06 p.m.
nothing for cops, nothing for firemen? nothing?!? i call shenanigans. Sun, Mar 18, 2012 : 12:19 p.m. Does it up different? What kind of creature thinks up such things? Branding should be qualified as a disease! Sun, Mar 18, 2012 : 11:22 a.m. Shouldn't it be &quot;differently?&quot; it answers the question, how? It's like people saying &quot;drive careful&quot; when you leave. Mon, Mar 19, 2012 : 1:58 a.m.
@Nicole, I don't think there's any misinterpretation. Mr. Twain, by his quote, clearly didn't care for adverbs, in and of themselves or as a replacement for adjectives. They were anathema to him. As such, I believe he would have countenanced the slogan as written, not as most of the commenters here have stated. Mon, Mar 19, 2012 : 1:04 a.m.
Sun, Mar 18, 2012 : 3 p.m.
Sun, Mar 18, 2012 : 2 p.m.
You are correct. People drop the &quot;ly&quot; off of too many words these days. I feel real bad for those who do not learn proper English. Sun, Mar 18, 2012 : 1:11 p.m.
Sun, Mar 18, 2012 : 10:47 a.m.
Yep, Ann Arbor does it up different: http://www.michigandaily.com/news/aapd-dps-respond-riot-south-university-and-church Thanks to the Michigan Daily for reporting local news scoops while Ann Arbor Dot Com covers the PR front. Lol. Mon, Mar 19, 2012 : 1:08 a.m.
That was a scary story for sure. But I've never heard of anything like it happening before… it's not really a regular occurrence, and in general, Ann Arbor is unbelievably safe for a place with a &quot;big-city vibe.&quot; I love our town, and I'm glad to see a campaign that might create us some extra revenue. Mon, Mar 19, 2012 : 12:50 a.m. I was there...nothing happened. Very overblown, which is perhaps why aa.com didn't cover the &quot;story&quot; initially. There were some overflowing trashcans and some excited pedestrians. If that is too much for you to handle, then you really don't appreciate that the U and its students is AA, not just something that pops up every once in a while so that people can groan about the &quot;out of control youngsters&quot;. Sun, Mar 18, 2012 : 8:12 p.m.
Sun, Mar 18, 2012 : 1:09 p.m. I note that a business owner complimented the &quot;overpaid&quot; police for doing a good job. Looks like A2 does it kind of like MSU does, or Oregon (http://www.deseretnews.com/article/700068606/9-arrested-after-400-riot-in-Oregon-college-town.html) , or Detroit after a sports championship, or Penn State , or well, lots of places in the world. Turns out A2 is made up of people, just like anywhere else. And, it seems like we have more Whiners than most places. I'm sorry Alan. I tried to click on your link, but it appears the improved commenting no longer allows for this. Sun, Mar 18, 2012 : 11:19 a.m. So very true. So very sad.